A memory brings a smile to his face. Then, we’re thrown into the waves that pound the beach, to the sound of “Helter skelter”, and images flicker past fast in the water – his memories – and the story we’re about to be told. This is the opening scene of Across the Universe, Julie Taymor’s movie musical (or ‘rock opera’ as she herself defines it), which is built on the music and lyrics of The Beatles. Like the opening scene described above, Gothenburg is also a windswept, rainy place when we meet Taymor there in connection to the city’s annual film festival. More than for her three feature films, Taymor is known as a prominent American stage artist within physical theater, musicals and opera. Her innovative interpretation of Lion King from 1997 became her great commercial breakthrough. ‘Variation’ is the key word to describe her three cinematic endeavours: Shakespeare adaptation Titus (1999), biographical artist portrait Frida (2002) and most recently Beatles rock opera Across the Universe (2007). All films has in common that they share the fruits of Taymor’s visual creativity and inventive use of film language. “Already when I was 11 years old I knew that I wanted to work in theater, and when I was 15 years old I joined a professional troupe. The year after I went to Paris and begun studies at L’École Internationale de Théâtre Jacques Lecoq, where I was made aware of pantomime and a kind of theater that focus more on the images than the words. We eliminated the playwright altogether,” she smiles. 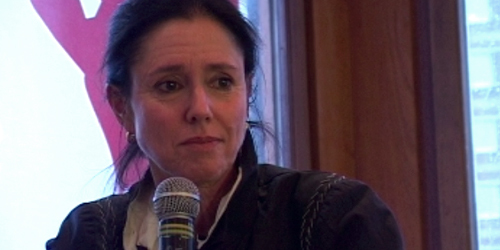 Taymor is born in 1952, and went through her artistic formation in between the 1960s and 70s. She talks about an inspiring period of upheaval where she moved into experimental physical theater, inspired by [British theater legend] Peter Brook. She also spent a period as part of the ensemble of Herbert Blau. Following these experiences, she spent four years in Asia, mainly in Indonesia. There she had close encounters with the theater of the indigenous people, and obtained an interest in masks and dolls. “These deeply traditional forms of doll- and shadow plays go back to the source of all entertainment, to the shamans. When I returned to the US and started my career in theater, it was both as a mask creator, an actress and a director. The bridge to cinema came twenty years later,” she explains. At the Masterclass she gives in Gothenburg the same day as our conversation, she shows a scene from Across the Universe which references clearly to her rich artistic background from theater. The sequence shows the inner and outer experiences of a character, Max, when he’s at the examination of men liable for military service at a conscription office in New York. 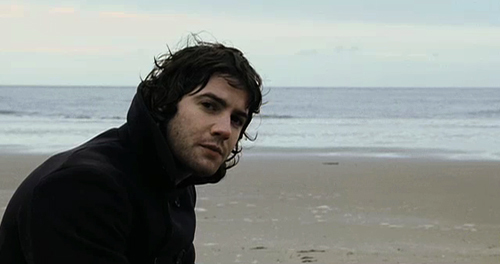 The Beatles’ song “I Want You” is the carrying element of the scene, and during the scant four minutes it lasts Taymor uses the verses as both dialogue and songs, and she employs both surrealistic spaces, masks and animations. “I could never do that scene on a stage. With “I Want You” I found two idiographs; Uncle Sam and the Statue of Liberty. Both tell everything about America’s military operations abroad, and what the servicemen sacrifice. The soldiers in the scene got masks that made them all look alike,” Taymor says with enthusiasm. “We turned the meaning of Beatles’ lyrics from being an expression of love to becoming a patriotic demand. And the verse continues: “She’s so heavy,” – and while they sing it, the soldiers carry the Statue of Liberty into Vietnam. With these images I didn’t need to show the whole draft process and all those elements that we know from before. Hopefully, with this scene, you’ll be into Max’s psyche before he’s sent to Vietnam.” I concur to her that, yes, it worked. At least for this member of the audience. “Oh, I love Françoise! We met on my first film, Titus, and I immediately understood that working with her would be invaluable. In addition to her immense experience, she has musicality. And on Across the Universe we finally got to make a musical together. All the possibilities to create transitions and juxtapose images through visible cuts, we employed very consciously. I’m drawn to surreal as well as realistic storytelling devices, and eventhough our scenes were carefully planned we improvised with our images many times a long the way. For example, a sequence like “Strawberry Fields Forever” arose to a large degree from experimentation during editing. “Cinema attracts me because it gives me the opportunity to express something that isn’t possible on a stage. At the same time, I’ve had a restricted budget on all my films. But that have only been positive for the creative process. For instance, on a film like Frida, my work on finding an idiograph for every scene became useful also in regards to production,” Taymor explains. “Since we couldn’t shoot Frida’s travels to New York and Paris in the actual cities, we solved those scenes by recreating small parts of those places that expressed Frida’s mood; New York became cold, tight and art deco – Paris became romantic and art nouveau. Same with the color palettes. If we would’ve had access to the actual places, we would’ve had too much to choose from. Limitations force you to find the essence of what you want to say, which is one of the most important things to know for an artist,” she concludes convincingly. 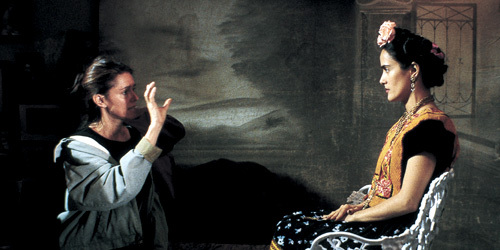 Julie Taymor and Salma Hayek shooting Frida. Julie Taymor puts a lot of words into every sentence she utters, and has an unusually well-articulated relation to her own process. But after having talked with her, I realized that, paradoxically, I had a problem with boiling it down to an essence. Yet after giving it some thought, I think what she is saying is this: All art is about telling one thing. At least one thing at a time, and knowing what that is. 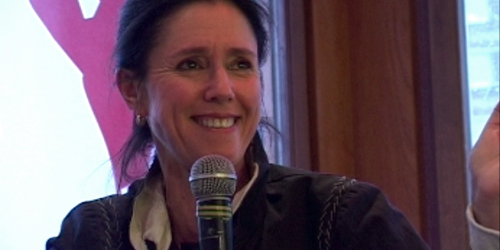 Taymor appears to still be exploring what film language can offer her as an artist. So to me there’s something contradictory to the fact that she’s involved in cinema to “do what you can’t do on stage” when, at the same time, her next project is a stage musical of Spider-Man (!) – check out the video of Taymor talking about it. And then, she’s off. I wanted to ask about the idiograph she’s creating for Spider-Man. But I guess we’ll find out. Soon.